put on one heck of a show to win that race,” said Tony of the victory. Actually, Matt Hirschman is somewhat of a master when it comes to Tour-type Modifieds even though he just debuted on the Modified Tour itself. He hasn’t raced any other type of car actually. At age 17, he tried out the back-up car for John Markovic and ran a few races here and there. 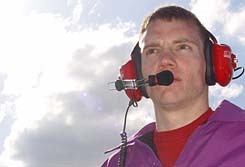 That grew into a longer schedule of race and from there, Hirschman joined Edelman’s team. The cars that Matt has driven have been similar all along, but the level of competition hasn’t been the same. Editor’s Note – At Waterford Speedbowl, two second generation drivers made their NASCAR Whelen Modified Tour debuts. 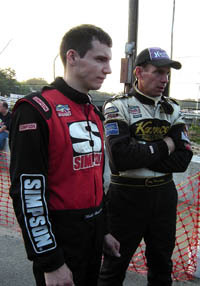 Speed51.com spent time with both Chris Pasteryak and his father Charlie, as well as Matt Hirschman and his father Tony. We found out a little bit about each new driver, how their races went and what their experienced fathers thought after the checkered flag waved and the dust settled. At Waterford’s NASCAR Whelen Modified Tour race, a driver named Hirschman hopped into a good racecar, qualified respectively and stayed out of trouble throughout 150 laps of short track beating and banging. His reward was a top 10 finish. After the race, the driver thought that a slightly better result than eighth could have been possible, but he was playing it conservatively and looking at the big picture in the race. After the race, Matt’s father was a proud man. Was that finish a result of any pre-race advice and coaching from Matt’s very experienced father? Tony Hirschman dismisses that idea quickly. There should have been no big story in that. After all, Tony Hirschman has been looking at the big picture for years and that approach has helped win 44 Mod Tour races and four championships. But it wasn’t Tony Hirschman who finished eighth at Waterford. It was his son Matt who was in his first Modified Tour event. In this case, the apple didn’t fall far from the tree at all. “For our first attempt at a Whelen Tour, I’m really happy with a top ten finish,” said the 22-year-old driver. “We qualified strongly in 12th and advanced up during the race to finish eighth. It was my first Tour race, my first race [of any kind] here and our first race together as a team. There were a lot of firsts tonight. Tony was busy running his own race, but tried to keep updated on Matt’s progress during the event as well. 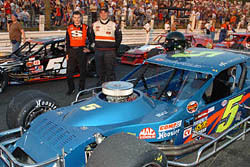 Matt will run a limited schedule of Modified Tour events in 2005 for car owner Ed Bennett. Hirschman also drives in a full schedule Race of Champions events for Scott Edelman. The week before Waterford, he won an event in that series at Mahoning Valley Speedway (PA) in the RoC ranks. Speed51.com also talked to Chris and Charlie Pasteryak after the Waterford event. For the other story in our series of second generation drivers debuting on the Modified Tour, please click here. Matt will be back in the #59 Tour Modified this weekend at Jennerstown Speedway (PA) and he knows that the ingredients for a bright future are right there with the team. Earlier this year, Speed51.com named Matt Hirschman as one of their honorable mentions in a mock short track draft of future talent in the sport. He was very honored by that selection.